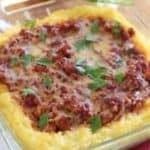 We love this ground beef or chicken Baked Polenta Pie! It's hearty and flavorful and a great change up from your regular dinner recipes. Bring water to boil. Add polenta. Bring to a simmer and cover loosely (have lid a bit askew so steam escapes). Check after a few minutes and stir. You don't need to stir this constantly but give it a good stir every few minutes. The polenta is done when it is thick, creamy and you can make a good indent in it. Takes about 30 minutes. Remove from heat. Add butter and parmesan. In a large skillet, brown your ground meat and transfer to a plate. Drain juices. Heat 2 tablespoons olive oil in skillet. Add onion and garlic. Sauté until onion is translucent. Add tomato paste, diced tomato. Simmer for a few minutes. Add zucchini and herbs. Simmer about 10 minutes until thick. Spray an 8 x 8 baking pan or deep pie dish with non stick cooking spray. Pour in polenta. Using the back of a spoon, push the polenta up the sides of the dish. Creating a well in the middle.This will get easier as it cools. Once you have a shallow 'pool' in the center, add your ragu. Bake for 40 minutes at 375 degrees until puffy and hot in the middles. Top with grated cheese and bake for additional 5 minutes.